Our team has been busy making improvements across the Hireology platform. From our Insights reporting, to a new top-tier job board partner, to making test results easier to find, here’s a quick overview of the updates you will see in your Hireology account today. In case you missed last week’s news, we launched our new reporting suite called Insights, transforming how to track hiring results within Hireology. Insights makes it simple to track Hiring Velocity – how fast you’re running your hiring process, and Process Adherence – ensuring each hiring manager follows every hiring step correctly. We’ll be releasing new insights in the coming weeks to help organizations understand the quality of their candidate sources with other metrics on track for later this summer. Not a customer yet? Signup here to get a quick demo from our team. We’re partnering with ZipRecruiter to bring one of the leading organic and paid job board networks within Hireology. Starting today, all customers posting jobs will automatically be picked up by the ZipRecruiter organic feed at no extra cost – and have the option to post on one of the largest job board networks nationwide. Learn more about ZipRecruiter by visiting the job board page within your account. Stay on top of candidate communication with our new email capture tool. Now when you start an email conversation with a candidate from inside Hireology, we’ll track all subsequent emails on the Candidate History page for that candidate. After the initial email is sent through Hireology you can continue the rest of the conversation through your email client (Gmail, Outlook, Yahoo, etc). This should help organize the full communication history of past notes, scheduling emails, and questions for every candidate. Skill tests and Caliper assessments help ensure you’re focusing on the best candidates for any open positions. Close in on top talent even faster with results appearing directly in your account as soon as candidates complete an evaluation. Candidate scores are stored for all candidates, keeping your records organized and out of your inbox. In addition to the score, the new Testing screen shows when each evaluation was completed and the option to download the full report. Our verification partner, Accurate Background, just enhanced the candidate experience to be 100% mobile-friendly. Candidates can now create an account, enter their details, and schedule drug screens from their phone or mobile device. If a candidate resides in a state requiring a web signature, Accurate’s new interface can allow them to sign on their device directly. Coming off our recent release of Hiring Steps, it’s now possible to archive older, unused steps to help keep your account clean and organized. Archived steps move to a separate tab so you can always access them in the future. Archiving a step that is in use by currently open jobs? We’ll ask you to either remove the step or to replace it with another version. 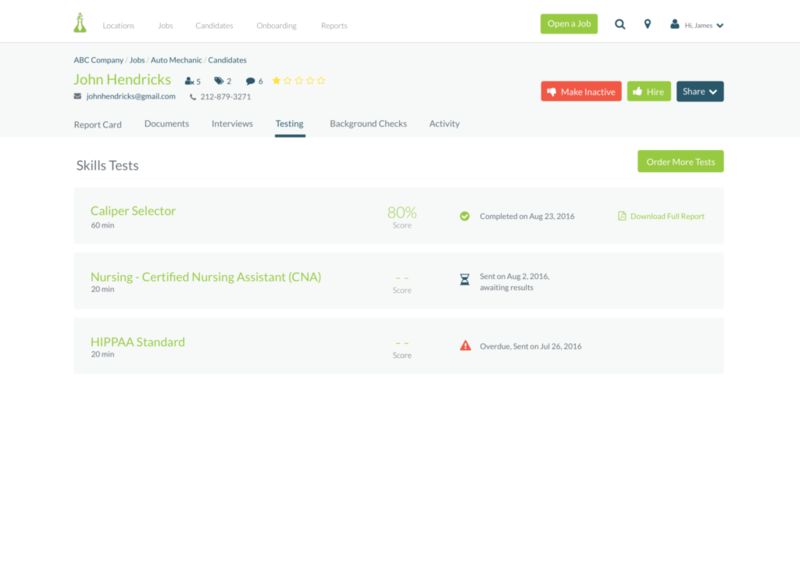 Hireology is continuing to refine even more features to give you more control of your hiring process. As we develop more sophisticated tools, we’ll need the best browsers to power our customer’s accounts. As a result, Hireology is officially dropping support for Internet Explorer. We encourage all customers to use a modern, secure browser for their Hireology accounts, including Microsoft Edge, Google Chrome, Apple Safari, or Mozilla Firefox. We know summer is a busy time for many of our customers, and we’re going to be hard at work releasing even more great features in the weeks ahead. Signup for our blog below to ensure you don’t miss our exciting updates.